Whenever data are categorical and their frequencies can be arrayed in multidimensional tables, log-linear analysis is appropriate. Like analysis of variance and multiple regression for quantitative data, log-linear analysis lets users ask which main effects and interactions affect an outcome of interest. Until recently, however, log-linear analysis seemed difficult -- accessible only to the statistically motivated and savvy. Designed for students and researchers who want to know more about this extension of the two-dimensional chi-square, this book introduces basic ideas in clear and straightforward prose and applies them to a core of example studies. 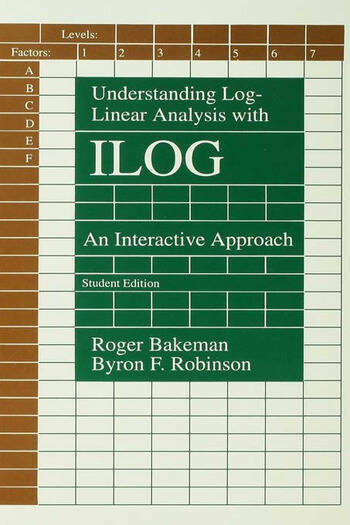 ILOG -- a software program that runs on IBM compatible personal computers -- is included with this volume. This interactive program lets readers work through and explore examples provided throughout the book. Because ILOG is capable of serious log-linear analyses, readers gain not only understanding, but the means to put that understanding into practice as well. Contents: Preface. Analyzing Quantitative and Qualitative Scores: An Introduction. Basic Statistics for Two-Dimensional Frequency Tables. Models for Two-Dimensional Frequency Tables. Fitting Models for Multidimensional Tables. ILOG Basics: Specifying a Frequency Table. Analyzing Frequency Tables With ILOG. Tallies: Enough, Too Many, None at All. Explicating Results: Percentages, Residuals, and Two-Way Tables. Appendices: Installing ILOG. Critical Values of Chi Square. "The book and program do the field a great service. They are models of clarity. I have tried comparable runs with both SAS CATMOD and SPSSX HILOGLINEAR, and can report that ILOG far outpaces them for ease of use."